My daughter is really into LEGOs and spends hours playing and building! She just discovered LEGO Friends and couldn't be more excited. I love that LEGO has finally created sets encouraging girls to keep building! 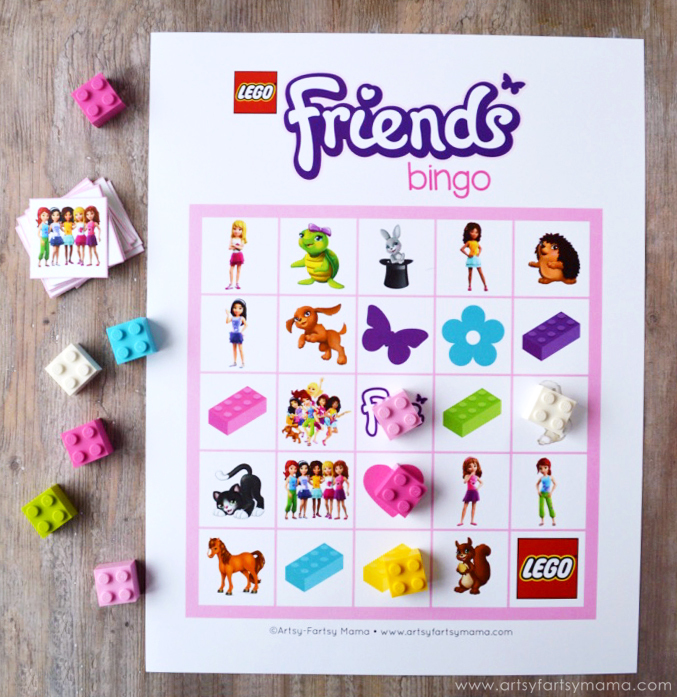 If your child is just as into LEGO Friends as mine is, or if you are planning a LEGO Friends party, this Free Printable LEGO Friends Bingo is so much fun to play and a quick way to get to know all the LEGO Friends characters!! LEGO Friends Bingo includes all of your favorite characters from LEGO Friends, as well as different color bricks and adorable pets!! In the bingo set, there are eight different bingo cards, so it's easy to print and use for your parties. It's fun for every age to play, and the calling cards include the names of the characters in case you don't know who they are. Print out the Blank LEGO Friends Bingo Set, which comes with a blank card ("free" space already added), 24 bingo pieces, and the calling cards. Cut the bingo pieces by following the lines. Glue the pieces wherever you want on the card with glue stick until all the spaces (except the "free" space) are covered. This would be a fun activity for older kids to do all on their own. Younger children will need some assistance with the cutting. 1. Grab some LEGOs or small candies to mark your squares. 2. Give each player a Bingo card and candies/markers (or put your own together with the blank set). Have each player put a marker over the free space. 3. Choose a calling card and say it out loud. Each player will cover that item on their card with a marker. Once a player has 5 squares covered in a row (horizontally, vertically, or diagonally), they call out "BINGO!" and win the game! 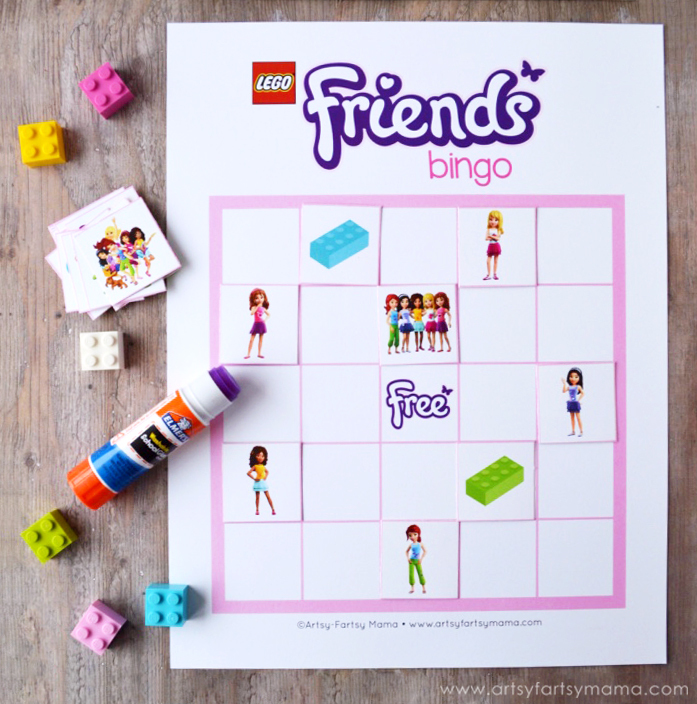 Thank you so much for offering Lego friends BINGO for free! Great idea in making the blank cards as well! Thank you! This will make a perfect game for my six year old's birthday. Thank you for sharing...What a great idea! My daughter's party is going to be so fun! I'm 13 and currently making a surprise bday party for my sis! This game is perfect, as I am inviting a lot of kindergartner cousins. I love your Lego Friends stuff! I love it. Thank you soo much! hey! I love these bingo cards:) I would love to use them for my daughter's party. I can't get them to download:( Do you have them handy in any other format? can it be emailed?! I love this! My daughter's 7th birthday sleepover is Friday, and this will be perfect. Thank you!